A landscape map of the Kalahari Gemsbok National Park is presented. Mapping is at a finer scale than previous vegetation and habitat maps for the same area. The landscapes were grouped into seven large classes and a total of 20 landscapes were mapped. A description of the terrain morphology, soil and vegetation of each landscape is provided. 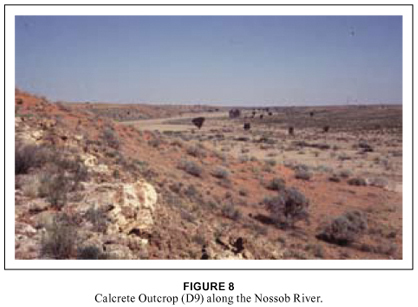 Landscapes that are focal points for the large animals of the region include the calcrete outcrops, riverbeds and pans. These landscapes cover only about 10% of the total area of the region. This map can be used as basis for park planning, management, research and other applications. The classification, description and mapping of plant communities and their associated abiotic features are vital first steps in building a framework to understand, protect, conserve and manage our natural resources. Mapping of physiographic-physiognomic relatively homogeneous spatial landscape units at an appropriate scale is therefore a basic requirement for objective resource assessment of any study area. Such a landscape map can amongst others be used to determine the geographical distribution and extent of different habitats; identify areas that are ecologically sensitive (disturbed or high in diversity); assess diversity and the status of rare and endemic species; provide a baseline for assessing range condition and grazing and browsing capacities; interpret animal movements and distribution; and position roads, lodges, hiking and off-road trails. The vegetation of the southern Kalahari as defined by Thomas and Shaw (1991), or parts thereof, has been described by Pole-Evans (1936), Acocks (1953), Story (1958), Brynard (1958), Leistner (1959a, 1959b, 1967), Giess (1971), Mostert et al. (1971), Bothma and De Graaff (1973), Leistner and Werger (1973), Coetzee and Werger (1975), Werger and Coetzee (1978), Gubb (1980), Werger (1986), Van Rooyen et al. (1988), Van Rooyen (1996) and Van Rooyen and Van Rooyen (1998). Interestingly, the vegetation of the Kalahari Gemsbok National Park (KGNP) was not included in the vegetation map of South Africa compiled by Acocks in 1953. In the refined mapping of the vegetation of South Africa (Low & Rebelo 1998), seven vegetation types were distinguished and mapped for the southern Kalahari savanna in South Africa of which two occurred within the boundaries of the park, i.e. the Thorny Kalahari Dune Bushveld and the Shrubby Kalahari Dune Bushveld. In the latest vegetation map of South Africa (Mucina et al. 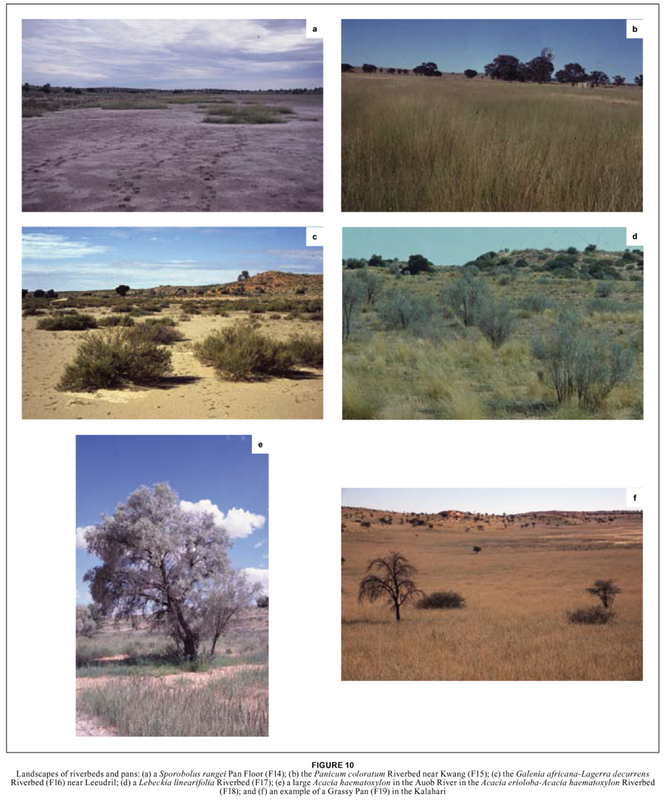 2005, Mucina & Rutherford 2006), seven vegetation types were identified in the KGNP. These seven types are the Nossob Bushveld, Gordonia Kameeldoring Bushveld, Gordonia Duneveld, Auob Duneveld, Southern Kalahari Mekgacha, Gordonia Plains Shrubland and Southern Kalahari Salt Pans. Three phytosociological studies have been conducted in the KGNP. The first classification was done by Leistner and Werger (1973) and 12 plant communities were distinguished and described but not mapped. They concluded that the pattern of the plant communities was determined by soil characteristics, such as soil-water regime and nutrient availability (Werger 1986). In 1999, Lubbinge (1999) did a more detailed study and distinguished 24 plant communities in the KGNP, which he combined into 14 mapping units. Van Rooyen (2000) expanded Lubbinge's floristic analysis to include the entire Kgalagadi Transfrontier Park. In the resultant vegetation map nine vegetation units were confined to the Botswana side of the Kgalagadi Transfrontier Park and 14 units were mapped for the South African side (KGNP) (Van Rooyen 2000). Bothma and De Graaff (1973) produced the first habitat map of the KGNP. Six major habitat categories were distinguished, viz. the riverbeds of the Auob and Nossob rivers; pans; tree savanna; dunes with tree- or shrub-covered crests; dunes superficially devoid of trees and shrubs; and flat, open grassy plains. The main objective of the current project was to produce a more detailed map of the KGNGNP that could be used for park planning and management. Such a map can be used to aid in the selection of sites for vegetation monitoring and serve as a basis to determine animal-habitat relationships. It can also be related to many other ecological spatial data sets, and by so doing it will help to identify knowledge gaps so that efforts to acquire additional data can be prioritised and coordinated. The units identified in the present study were termed landscapes following the definition of Gertenbach (1983): "A landscape is an area with a specific geomorphology, macroclimate, soil and vegetation pattern and associated fauna". The study area comprises the South African portion of the Kgalagadi Transfrontier Park (Fig. 1), as well as a narrow zone along the eastern side of the Nossob River in Botswana. The mapped area covers approximately 10 932 km2. The southern Kalahari is a summer rainfall region and the mean annual rainfall ranges from 150 mm in the southwest to 450 mm in the northeast in Botswana. In the study area the mean annual rainfall ranges from approximately 185 mm to 230 mm. Rainfall is highly erratic (Skarpe 1986, Tyson 1986) and at any specific locality in the park can vary from less than 100 mm up to more than 700 mm per annum. The highest rainfall occurs in the four months January to April, with a peak in March. Temperatures show a large amplitude with winter lows reaching -10.3ºC and summer highs reaching 45.4ºC (Van Rooyen et al. 1990). Stratification and interpretation of the area was done with Landsat ETM satellite images (Bands 4, 5 and 3 [R,G,B]) 1:5000 orthophoto maps and previous habitat and/or vegetation maps and/or descriptions produced by Leistner (1967), Bothma and De Graaff (1973), Leistner and Werger (1973), Skarpe (1986), Bothma and Swart (1990), Bothma et al. (1993), Van Rooyen and Van Rooyen (1998), Lubbinge (1999) and Van Rooyen (2000). In addition to the floristic data of more than 500 phytosociological relevés, qualitative vegetation and habitat surveys were conducted throughout the park based on the stratification of the available imagery. The data collected at each sample site were a global positioning system (GPS) coordinate, terrain morphology, soil type, soil texture, soil colour, dominant plant species and vegetation structure. 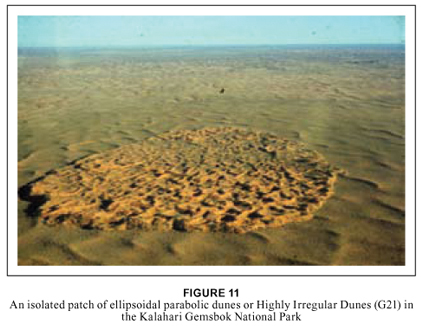 The southern Kalahari environment is relatively homogeneous because of the predominance of the sand mantle covering the area. The differences between the landscape units that were distinguished in this study are therefore often subtle. The same plant species occur in most of the units, and the differences between the units can often only be ascribed to terrain morphology, e.g. dune height and pattern, or soil characteristics, which relate to soil-water and nutrient supply (Werger 1986), or changes in the dominance and structure of the plant species. The landscapes and their associated vegetation identified in Fig. 2 were grouped into seven large classes and a total of 20 landscapes were mapped (Table 1). A key has been provided in the form of a dendrogram (Fig. 3) that can be used to classify landscapes in the field. An overview of the main corresponding vegetation units in the latest vegetation map of South Africa (Mucina & Rutherford 2006) is provided in Fig. 4. In general, the mapping units of Mucina and Rutherford are heterogeneous assemblages compared to the units presented here. An electronic ArcView-compatible version (raster or vector format) of the landscape map is available from the authors on request. A printable version at a scale of 1:150 000 when printed to media 841 mm by 1 400 mm is also available. The pdf version provided here should best be printed to A3. These grass-covered, relatively parallel (linear) high dunes occupy an area of 40 951 ha (3.75% of the mapped area; Fig. 2) and occur in the south in the vicinity of Twee Rivieren. Fig. 5a illustrates the parallel (linear) dunes that are up to 20 m in height in this unit. The coarse, red, loose sand of the dune crests is dominated by the tall grass Stipagrostis amabilis while the shrub Acacia haematoxylon is the most conspicuous and widespread woody species on the grassy dunes and in the valleys. Besides Stipagrostis amabilis, the other prominent grass species are Schmidtia kalahariensis, Centropodia glauca, Eragrostis trichophora, E. lehmanniana, Brachiaria glomerata and Stipagrostis uniplumis. The most common dwarf shrubs or forbs include Hermannia tomentosa, Plinthus sericeus, Requienia sphaerosperma, Bulbostylis hispidula, Limeum arenicolum, Oxygonum dregeanum and Sesamum triphyllum. The prostrate creepers Acanthosicyos naudinianus and Citrullus lanatus may be seasonally prominent on exposed dune crests. In isolated patches within this landscape unit, the shrub Lebeckia linearifolia is a prominent species found on dunes near pans and rivers. This extensive dune landscape (Fig. 5b) occurs south of the Auob River and between the Nossob and Auob rivers in the south and occupies an area of 127 532 ha (11.67% of the mapped area). The unit is characterised by scattered Acacia haematoxylon trees and shrubs, while the presence of Boscia albitrunca and Acacia mellifera differentiates this unit from the previous one. The prominent grasses are Stipagrostis amabilis, Eragrostis trichophora, Brachiaria glomerata, Stipagrostis uniplumis, S. ciliata, Centropodia glauca and Schmidtia kalahariensis. Rhigozum trichotomum dominates the whitish calcareous soils in the dune valleys and depressions. In these patches Harpagophytum procumbens, Jatropha erythropoda and Dipcadi gracillimum are the diagnostic species. This open tree savanna (Fig. 5c) occurs widespread on the deep, reddish sand in the duneveld and near rivers and pans, mostly along a strip on the northern side of the Auob River and on both sides of the Nossob River from Samevloeiing in the south to Langklaas in the north. The landscape unit also occurs south of Grootkolk in the north. It is the third largest unit in the KGNGNP and covers an area of 175 923 ha (16.09% of the mapped area). The prominent woody species are Acacia erioloba, A. haematoxylon, Boscia albitrunca and Grewia flava. Acacia mellifera is particularly prominent against north to northeast-facing slopes. The diagnostic species on the dune slopes are Searsia tenuinervis (= Rhus tenuinervis), Lycium bosciifolium, L. villosum and Ehretia alba. Conspicuous dwarf shrubs are Asparagus nelsii, Gnidia polycephala and Rhigozum trichotomum. The most common grass species include Schmidtia kalahariensis, Eragrostis lehmanniana, Centropodia glauca, Stipagrostis uniplumis and S. ciliata. Common herb species are Crotalaria sphaerocarpa, Pollichia campestris, Bulbostylis hispidula, Sesamum triphyllum, Limeum fenestratum, L. argute-carinatum and Cleome kalachariensis. This open tree savanna occupies 38 993 ha (3.57% of the mapped area) and occurs in the interior duneveld in the north in the vicinity of Loffiesdraai, Dankbaar, Gharagab and Bayip and west of the Nossob River near Grootbrak. The dunes are typically from 6 m to 9 m high in the interior and from 9 m to 15 m high along the rivers. The landscape is relatively species poor and is dominated by Acacia erioloba and Schmidtia kalahariensis (Fig. 6a). Other prominent woody species are Rhigozum trichotomum, Boscia albitrunca and Acacia mellifera and occasionally Searsia tenuinervis, Cadaba aphylla and Lycium spp. Terminalia sericea is locally prominent on the higher dunes. Besides Schmidtia kalahariensis, the grass layer is characterised by Eragrostis lehmanniana, Centropodia glauca, Stipagrostis amabilis, S. uniplumis, Brachiaria glomerata and Stipagrostis ciliata. Herbs that are found in this unit include Hermannia tomentosa, Hermbstaedtia fleckii, Requienia sphaerosperma, Pupalia lappacea, Chrysocoma obtusata, Cynanchum orangeanum and the climber Pergularia daemia. Isolated patches of either Acacia luederitzii or Albizia anthelmintica occur on dunes and slopes within this unit in the northern parts of the park, especially west of the Nossob River in the vicinity of Grootbrak and Bayip Pan (Fig. 6b). Although many of these patches are too small to be mapped individually, the larger ones have been mapped (unit 4a in Fig. 2) and in total cover 532 ha (0.05% of the mapped area). Other woody species associated with these patches include Acacia erioloba, A. mellifera, Boscia albitrunca and Grewia flava, with Schmidtia kalahariensis the dominant grass species. This is the largest landscape unit in the park, covering an area of 243 155 ha or approximately 22% of the mapped area (Fig. 2). It encompasses the grass-covered irregular dunes (Fig. 6c) in the southwestern section, east of Mata-Mata and north of the Auob River in the Strathmore, Nu Quap, Copeng and Lammermoor areas, as well as from the south to the far north in the eastern interior duneveld. A large number of pans are scattered throughout this landscape. Acacia haematoxylon is the most conspicuous woody species with Stipagrostis ciliata, Centropodia glauca and Stipagrostis amabilis the prominent grass species. Other widespread grass species in this unit include Stipagrostis uniplumis, Brachiaria glomerata, Schmidtia kalahariensis and Eragrostis lehmanniana. The forb layer is characterised by Requienia sphaerosperma, Sesamum triphyllum, Hermannia tomentosa, Plinthus sericeus, Oxygonum dregeanum and Limeum arenicolum. The prostrate cucurbits Citrullus lanatus and Acanthosicyos naudinianus are sometimes prominent. The vegetation on the dune slopes often differs from that in the interdune valleys. The prominent woody species on the dune slopes are Acacia mellifera, Boscia albitrunca and Acacia haematoxylon with Centropodia glauca, Schmidtia kalahariensis, Eragrostis lehmanniana, Requienia sphaerosperma and Senna italica the conspicuous grass and forb species. The prominent woody species in the grass-covered dune valleys on deep greyish to reddish sand are Acacia mellifera, Rhigozum trichotomum and Acacia haematoxylon. The more common grass and forb species include Stipagrostis uniplumis, Centropodia glauca, Eragrostis lehmanniana, Schmidtia kalahariensis, Chascanum pumilum, Hermannia burchellii, Senna italica, Limeum argute-carinatum and Ipomoea hackeliana. In the dune valleys, near pans and rivers on slightly compact calcareous and whitish sand, open to dense stands of Rhigozum trichotomum, Monechma incanum and Stipagrostis obtusa dominate. Aptosimum albomarginatum, Talinum caffrum, Stipagrostis ciliata and Tribulus zeyheri are some of the other prominent species on these calcareous soils. This undulating shrubby grassland covers the second largest area in the KGNP (182 889 ha or 16.73%) and occurs throughout the interior duneveld from Kij Gamies in the south to Union's End in the north. The prominent woody species in this undulating landscape are Acacia haematoxylon, Acacia erioloba and Boscia albitrunca, with Centropodia glauca, Aristida meridionalis, Schmidtia kalahariensis, Eragrostis lehmanniana and Stipagrostis uniplumis the conspicuous grass species (Fig. 6d). The characteristic dwarf shrubs and forbs include Requienia sphaerosperma, Chascanum pumilum, Hermannia burchellii, Limeum argute-carinatum, Ipomoea hackeliana, Chascanum garipense and Senna italica. This shrubby grassland on deep sand of gently undulating plains covers a large area (115 479 ha or 10.56% of the mapped area) and occurs in large patches from south to north throughout the interior duneveld. The dunes are not prominent, and if they occur they seldom reach 6 m in height. Acacia haematoxylon is the conspicuous woody species, usually as shrub, with Stipagrostis amabilis the most prominent grass species (Fig. 7a). Other grass species of note are Schmidtia kalahariensis, Centropodia glauca, Eragrostis lehmanniana, Stipagrostis uniplumis and Brachiaria glomerata. The most common dwarf shrubs and forbs include Requienia sphaerosperma, Bulbostylis hispidula, Acanthosicyos naudinianus, Citrullus lanatus, Hermannia tomentosa, Plinthus sericeus, Oxygonum dregeanum, Sesamum triphyllum and Limeum arenicolum. These flat, grassy plains (Fig. 7b) with scattered shrubs of Acacia haematoxylon are found in the central interior duneveld, with undulations of less than 2 m. The unit covers 4.68% of the total mapped area (51 199 ha). The grass Stipagrostis amabilis is dominant together with prominent species such as Aristida meridionalis, Centropodia glauca, Eragrostis lehmanniana, E. pallens, Stipagrostis uniplumis and Brachiaria glomerata. The calcrete outcrops, terraces and floodplains along the Auob and Nossob rivers and at pans (Fig. 8) where whitish calcareous and compact sandy soils occur are characterised by a specific plant assemblage. This small unit covers only 0.53% of the mapped area (5 826 ha). Scattered individuals of Acacia erioloba, A. mellifera, Boscia albitrunca, Lycium bosciifolium and Grewia flava occur in this unit, which is dominated by dwarf shrubs such as Rhigozum trichotomum, Monechma genistifolium subsp. australe, Zygophyllum pubescens, Ehretia alba, Leucosphaera bainesii, Plinthus cryptocarpus, Salsola tuberculata and Aizoon schellenbergii. The grass layer is poorly developed and is characterised by Enneapogon desvauxii, E. scaber, Stipagrostis hirtiglumma, Cenchrus ciliaris, Fingerhuthia africana, Stipagrostis ciliata, S. obtusa and the ever-present Schmidtia kalahariensis. Other prominent dwarf shrubs, forbs and succulents are Indigofera auricoma, Barleria rigida, Chamaesyce glanduligera, Ptycholobium biflorum, Tribulus zeyheri, Cleome angustifolia, Adenium oleifolium and Euphorbia braunsii. This landscape is characterised by scattered large Acacia erioloba trees on slightly compact, calcareous and whitish sand in the dune valleys, near pans and along the Auob and Nossob rivers throughout the park (Fig. 9a). It covers an area of 38 764 ha (3.55% of the mapped area). The most noteworthy woody species are Acacia erioloba, A. luederitzii, A. mellifera, Boscia albitrunca, Grewia flava, Searsia tenuinervis, Lycium bosciifolium, L. hirsutum and Ehretia alba. Open to dense stands of Rhigozum trichotomum, Monechma incanum and Aptosimum albomarginatum often develop. The dominant grass species are Stipagrostis obtusa, Schmidtia kalahariensis, Eragrostis lehmanniana, Stipagrostis ciliata and S. uniplumis. Herbs include Talinum caffrum, Requienia sphaerosperma, Sesamum triphyllum, Phyllanthus maderaspatensis, Limeum aethiopicum and Tribulus zeyheri. This shrubland is related to unit 10 and can be found on calcareous terraces near pans and rivers throughout the park (Fig. 9b). It covers an area of 34 431 ha (3.15% of the mapped area). The dominant woody species in this unit is Acacia mellifera, with other less frequent woody species being Boscia albitrunca, Acacia erioloba, Grewia flava, Lycium bosciifolium, Searsia tenuinervis, Ehretia alba and Rhigozum trichotomum. The dominant grass species are Stipagrostis obtusa, S. ciliata, Schmidtia kalahariensis and Stipagrostis uniplumis. This small unit is characterised by dwarf shrubs on the edges of pans and calcareous outcrops along the Nossob River and is well-developed in the vicinity of Polentswa (Fig. 9c). It covers an area of only 1 594 ha, constituting 0.15% of the mapped area (Fig. 2). The diagnostic species are Salsola tuberculata, Eriocephalus decussata, Monechma genistifolium subsp. australe and Plinthus karrooicus. Other conspicuous species are Rhigozum trichotomum, Salsola etoshensis, Eriocephalus pubescens, Zygophyllum simplex, Leucosphaera bainesii, Hypertelis salsoloides, Pseudogaltonia clavata and Rosenia humilis. Grasses are represented by Enneapogon desvauxii, Stipagrostis obtusa, Eragrostis truncata, E. echinochloidea, Sporobolus rangei and Schmidtia kalahariensis. This species-poor unit is characterised by an almost uniform and dense monoculture of the grass Stipagrostis obtusa and occurs locally on whitish, compact sandy soils on terraces and floodplains next to the Nossob River (Fig. 9d). Other infrequent species are Rhigozum trichotomum, Schmidtia kalahariensis, Gisekia africana and Eragrostis annulata. The unit covers 2 667 ha (0.24% of the mapped area). Essentially two types of pan can be found, i.e. those with a bare pan surface (landscape 14) and grassy pans (landscape 19). Bare pan surfaces are commonly referred to as salt pans (Leistner 1967, Parris 1984, Van Rooyen 1984). They occur on whitish, calcareous, strongly alkaline and silty soils (Fig. 10a) and cover an area of 3 024 ha (0.28% of the mapped area). The vegetation of the pans differs noticeably from the surrounding savannas and often shows a concentric zonation. The vegetation of the pan floor and periphery is characterised by grasses such as Sporobolus coromandelianus, S. rangei, Eragrostis echinochloidea and Enneapogon desvauxii and dwarf shrubs such as Zygophyllum tenue, Salsola etoshensis, S. namaqualandica, Eriocephalus aspalathoides and Lycium cinereum. Further out from the pans is a zone of scattered trees of Acacia erioloba and Boscia albitrunca with dwarf shrubs such as Rhigozum trichotomum, Monechma incanum, M. genistifolium subsp. australe, Barleria rigida, Asparagus bechuanicus and Aptosimum albomarginatum. Prominent grass species in this zone include Eragrostis truncata, Tragus racemosa, Eragrostis porosa, Stipagrostis ciliata, S. obtusa and Schmidtia kalahariensis. Around some of the northern pans in the park, e.g. Bayip, stands of Albizia anthelmintica trees are prominent. This riverbed unit occurs especially in the northern parts of the Nossob River and is characterised by a dense grass stratum and large scattered trees of Acacia erioloba (Fig. 10b). It covers an area of 6 917 ha (0.63% of the mapped area). The dominant grass species are Panicum coloratum, Eragrostis bicolor, Chloris virgata, Eragrostis rotifer, E. annulata, E. porosa, Schmidtia kalahariensis and Enneapogon desvauxii. The unit is rich in forb species, e.g. Cullen obtusifolia, Hermannia modesta, Cucumis africanus, Platycarpha carlinioides, Heliotropium lineare, Boerhavia repens, Stachys spathulata, Radyera urens, Cucumis africana, Aptosimum spinescens, Geigeria pectidea and G. ornativa. Setaria verticillata is a prominent grass species beneath trees in the riverbeds. This unit occurs locally in the Nossob riverbed from the confluence with the Auob River northwards to Nossob Camp and covers 6 321 ha (0.58% of the mapped area). It is differentiated by the shrubs Galenia africana, Lagerra decurrens and Deverra denudata (Fig. 10c). Scattered Acacia erioloba trees occur while Chloris virgata, Panicum coloratum, Schmidtia kalahariensis and Eragrostis porosa are the prominent grass species. In the lower Auob and Nossob rivers near Twee Rivieren the riverbed is dominated by the shrub Lebeckia linearifolia (Fig. 10d). This small unit covers only 911 ha (0.08% of the mapped area). Lebeckia linearifolia also occurs on dunes in landscape unit 1. This savanna occurs as a narrow zone on moderately compact calcareous sandy soils on the banks of the Auob River and occupies 4 351 ha or 0.40% of the mapped area (Fig. 2). It is characterised by large trees of Acacia erioloba and A. haematoxylon (Fig. 10e) and the shrub Rhigozum trichotomum. The prominent grass species are Schmidtia kalahariensis, Stipagrostis obtusa and Eragrostis porosa, and the forb Tribulus zeyheri also occurs. These pans occur throughout the park and in total they cover approximately 1% of the mapped area (10 782 ha) (Fig. 10f). These pans differ from the bare pans in having a lower concentration of minerals, mainly sodium chloride, on the pan floor (Parris 1984). The most prominent grass species are Sporobolus rangei, Stipagrostis ciliata, S. obtusa, Eragrostis echinochloidea, Enneapogon desvauxii, Eragrostis truncata, Tragus racemosa and Eragrostis porosa. This landscape is characterised by dwarf shrubs such as Salsola etoshensis, Eriocephalus pubescens, Zygophyllum simplex, Z. tenue, Rhigozum trichotomum, Hypertelis salsoloides and Rosenia humilis on the edge of pans. Forbs such as Aptosimum lineare, Trianthema parvifolia, Geigeria ornativa, Heliotropium lineare, Cucumis africanus and Indigofera alternans and geophytes such as Nerine laticoma and Pseudogaltonia clavata are found in this landscape. This striking landscape with ellipsoidal parabolic dunes (Eriksson et al. 1989) is found in a few isolated patches in the interior duneveld of the park (Fig. 11). The unit covers only 917 ha (0.08% of the mapped area) and is characterised by scattered trees and shrubs of Boscia albitrunca and Acacia mellifera. The prominent grass species include Stipagrostis amabilis, Eragrostis trichophora, Brachiaria glomerata and Schmidtia kalahariensis. The whole area of the KGNP is fairly homogeneous and for the most part belongs to the Kalahari Duneveld Bioregion (Mucina & Rutherford 2006), characterised by Acacia erioloba, Rhigozum trichotomum and Schmidtia kalahariensis. The vegetation structure is predominantly that of a shrubby grassland, except in the north and along the Auob and Nossob rivers where an open tree savanna is found. Topographically the area can be divided into dunes (dune crests and dune valleys); sandy plains with red to pinkish sand; and rivers (including terraces and calcrete outcrops) and pans on whitish, compact calcareous sand and clay. The vegetation on fine-textured soils, such as those found in the pans, frequently shows a Karroid nature (Leistner 1967). The southern Kalahari is described as a floristically impoverished area. The homogeneity of the relatively recent sand deposits leads to reduced landscape differentiation and thus low niche differentiation. The Kalahari is therefore not a 'hotspot' in terms of plant species richness or rarity. The vegetation and landscapes around pans and along the rivers are the most diverse (Van Rooyen & Van Rooyen 1998). However, there are a number of plant species that are of special interest in the KGNP. These species are all common and abundant species elsewhere but are of rare occurrence in the park. For example, Parkinsonia africana is known only by a small population that occurs in the lower Nossob River. Other woody species that are relatively rare in the park include Boscia foetida subsp. foetida on calcrete ridges in the south of the park, Cadaba aphylla, Diospyros austro-africana and Ehretia alba. A few individuals of Dichrostachys cinerea are found in the north near Grootbrak and Union's End in landscape unit 6. Likewise, Catophractes alexandrii is limited to the extreme northern part of the KGNP on calcrete ridges adjacent to the Nossob River, although it is abundant on the Botswana side of the Kgalagadi Transfrontier Park. Albizia anthelmintica and to a large extent also Acacia luederitzii have restricted distributions on the South African side of the Kgalagadi Transfrontier Park. Albizia anthelmintica reaches its southwestern distribution limit in South Africa in the park whereas Acacia luederitzii is one of the few species endemic to the Kalahari. Terminalia sericea is locally prominent on the higher dunes in the northern part of the park, especially in landscape unit 4. The false camel thorn Acacia erioloba x Acacia haematoxylon is relatively rare but is found in the southern parts of the park along the Auob and Nossob rivers. Woody species that have been recorded on the Botswana side of the Kgalagadi Transfrontier Park and not yet on the South African side include several Commiphora species, Grewia flavescens, Ochna pulchra, Vangueria infausta, Tylosema esculentum and Ziziphus mucronata. The shrub Phaeoptilum spinosum was recorded south of the park but not yet in the Kgalagadi Transfrontier Park. The characteristic tree species in several of the landscapes, i.e. Acacia erioloba, Acacia haematoxylon and Boscia albitrunca, are listed as protected trees through the National Forestry Act by the Department of Water Affairs and Forestry. Acacia erioloba is regarded as a keystone species and the survival of many other animal and plant species depends on it (Dean et al. 1999). Although wood harvesting, especially that of Acacia erioloba, is a serious problem outside the boundaries of the park, wood harvesting is not permitted inside the park. Alien invasive plant species are not a big problem in the KGNP. Large Prosopis glandulosa trees occur in the camps but have not yet been noticed spreading into the natural vegetation. 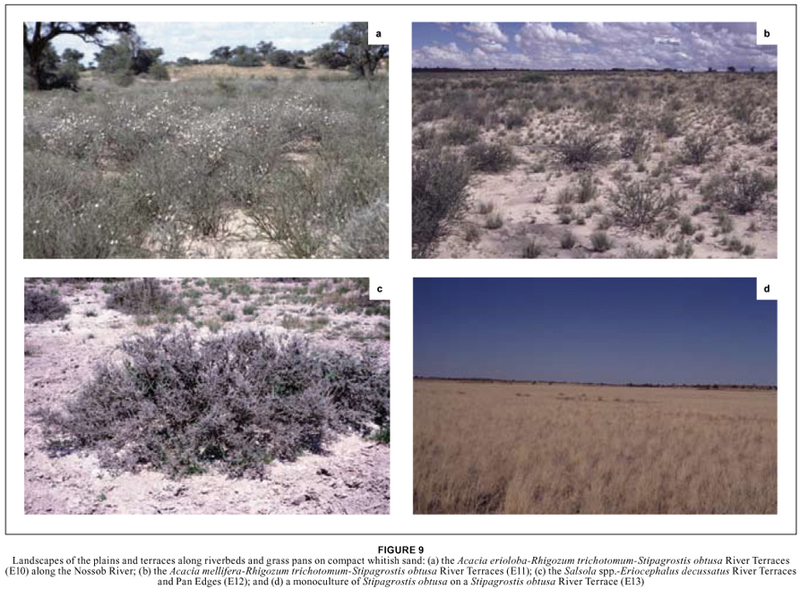 Other species that have been listed as invasive in the Kalahari environment include Prosopis chilensis, Verbesina enceloides and Argemone ochroleuca. The landscapes most prone to invasion by alien species are the riverbeds (landscapes 15 to 18). The aims of the present map were to identify landscapes and their associated vegetation to assist in vegetation and animal conservation and tourist management. Landscapes that play an important role in the ecological relationships of the region include the calcretes, riverbeds and pans (landscape units 9 to 19). These landscapes cover only about 10% of the total area but are focal points for the large animals of the region (Parris 1970, 1984, Child et al. 1971, Bothma & Mills 1977, Mills & Retief 1984, Bergstrom & Skarpe 1999). Most of the animal sightings are concentrated in the riverbeds and pans that cover less than 4% of the total area. 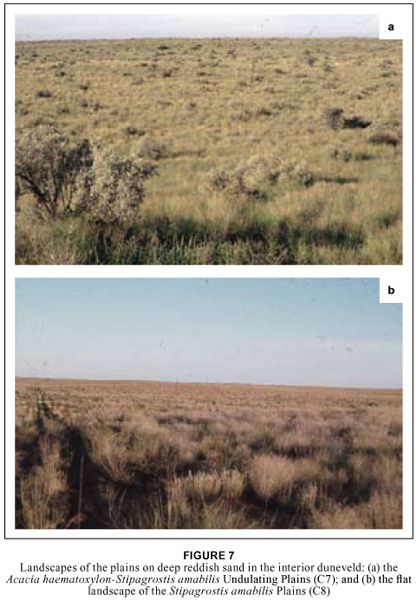 The interior dunes and plains (landscape units 1 to 8) are usually used by wildlife only in the wet season when the food plants are not as nutrient deficient as during the dry season (Stapelberg 2007). Although animals tend to congregate in the river systems, grazing impacts are localised and controlled by a natural rotational grazing system, with the availability and nutritional quality of food rather than water controlling animal numbers (Van Rooyen & Van Rooyen 1998). The seasonal migratory movements of wildlife is essential to maintain good veld condition and ensures that a long-term ecological balance prevails, which should continue if the present large size of this conservation area is maintained (Van der Walt et al. 1984). Artificial water provision does affect some aspects of the ecology of the system (Van Rooyen et al. 1994), but these watering points are deemed necessary from a tourist point of view (Knight & Knight-Eloff 1988). The landscapes most affected by artificial water provision are landscapes 9 to 18.
the occurrence of alien plant species such as Prosopis spp. and Argemone ochroleuca in the riverbeds and pans (landscapes 10 to 19). These monitoring efforts should determine the dynamics and trends of the ecosystem attributes and the extent to which the conservation objectives are being met. Geographic information systems (GIS) would be an ideal tool for managing such spatially related databases (Kotzé & Fairall 2006). It is imperative that the results of monitoring be used to adapt management policies when necessary. By basing the monitoring efforts on the present landscape units, this map will assist in resource management that is based on the inherent ecological capacity of the ecosystem. We gratefully acknowledge the assistance of South African National Parks and specifically Dries Engelbrecht, Nico van der Walt, Nardus du Plessis and Hugo Bezuidenhout. Johan Kriek and the Van Rooyen family assisted with the field work.